This is what the Italians would call my piatto del cuore, a dish with sentimental value. 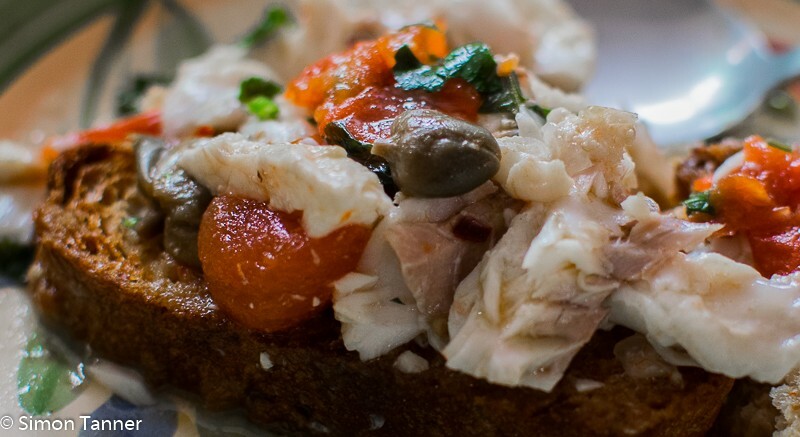 It brings together one of my favourite fish – the ugly but delicious scorfano – and possibly my favourite place, the island of Stromboli, where this is a local delicacy. 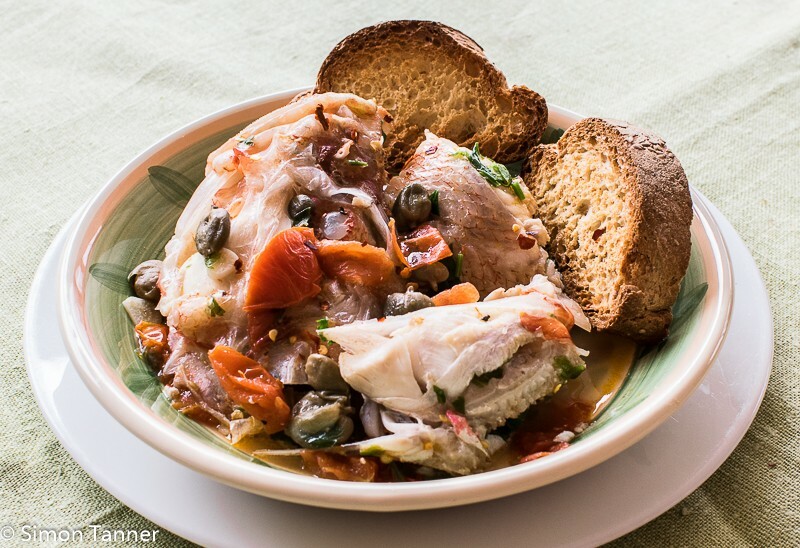 Capers are another love, and as I have mentioned before, those on Stromboli are particularly good, large and meaty. 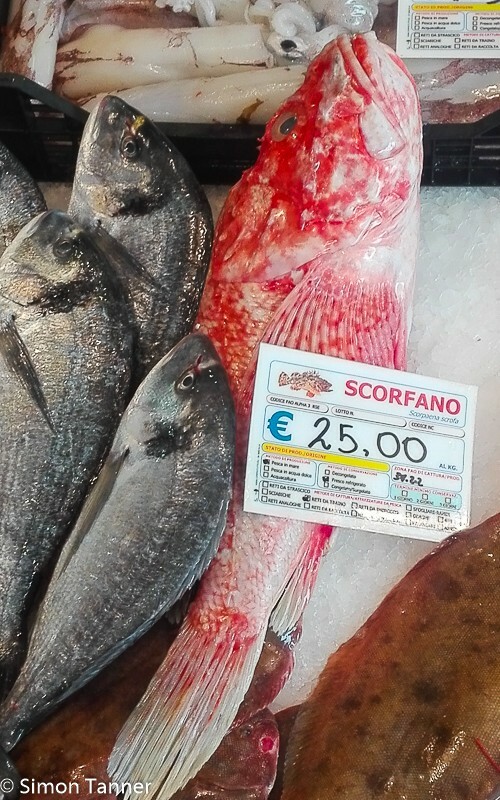 Today’s scorfano was in fact cooked using some from my secret reserve provided by Pino, one of the island’s peddlers of fish, who spent the first couple of years I went there trying to swindle me, before being forced to accept I was evidently not as gullible as I looked. He now treats me with grudging respect and, dare I say it, something bordering on affection. As Pino would have learned earlier, if he had asked around, when it comes to food, my suspicious nature and demands for detailed information make the Spanish Inquisition look like the Samaritans. I have been told by various people that I can strike the fear of God into market traders with the merest of glances. My daughter said that going shopping with me is like being in the company of a Mafia boss, as purveyors of foodstuffs bend over backwards to give me freebies and discounts, go so far as to ward me off their own wares if they’re not up to scratch, and generally cower in submission, as if concerned that selling me a dodgy carrot could result in a burnt out car or a supporting role in the next motorway bridge. Anyway, back to the scorfano. It has a stronger taste than most white fish, which is why it can cope with capers. Some even add black olives, but experience has taught me that this is going too far, since they overpower it. Fine with the much meatier tuna, but not the best option here. By the way, make sure you get the whole fish, not just fillets, since the best flesh is on the head – particularly the cheeks and the parts attached to the jaw. No surprise there, of course. Just like meat, fish is tastier when cooked on the bone, and the best bits are those closest to it. Gently fry the garlic in the oil for a couple of minutes in a wide pan for which you have a lid. Add the tomatoes, turn up the heat and fry for another minute. Add the wine, capers and 200ml water. Bring to the boil and add the fish pieces. Bring back to the boil and then lower heat to a low simmer. Cover and cook for about twenty minutes until the fish is cooked. Towards the end, add the parsley. While the fish is cooking, place the bread slices on a baking sheet and bake in the oven until golden brown (about 15 minutes). Serve the fish with the crostini and the cooking broth. Drizzle over some more oil if you like. Chilli flakes also make a welcome addition. Accompany with what’s left of the bottle of white wine. This entry was posted in Fish, Recipes and tagged fish, scorfano, scorpion fish, strombolana, stromboli by hungryenglishman. Bookmark the permalink.